Now they are up to 12″ tall and starting to bloom. A picture update after a mow and fresh edging today. 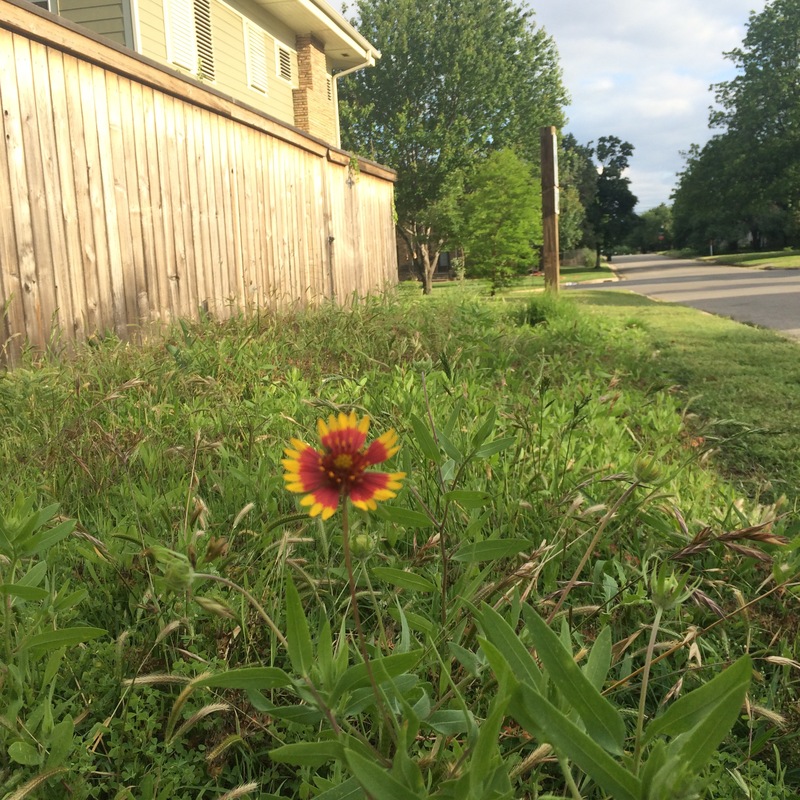 Several Blanket Flowers blooming now. The Call OKIE guys have been out and remarked the orange lines twice. No digging or boring yet on either side of the street. First of many to come. They’re all over in the pocket prairie! Obviously not from today as it’s completely overcast. 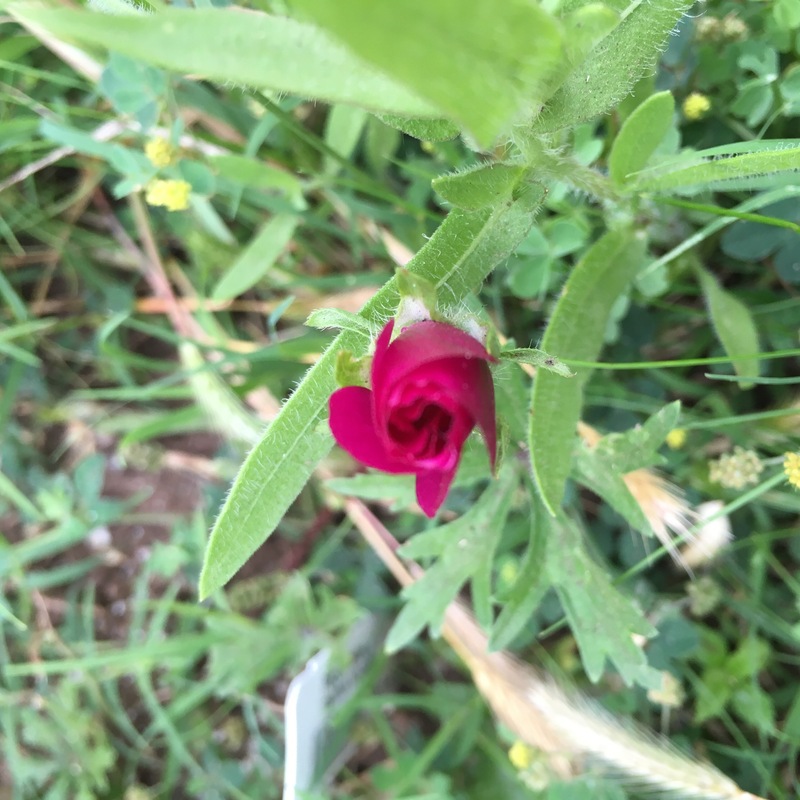 We are so close to having our first seeded flowers bloom! On May 6, I showed you the spray painted lines and flags indicating where OG&E intended to put a new main line underground. I’ve since found out that the line will be going on the other side of Military Ave. and will affect our neighbor’s lot, not ours. 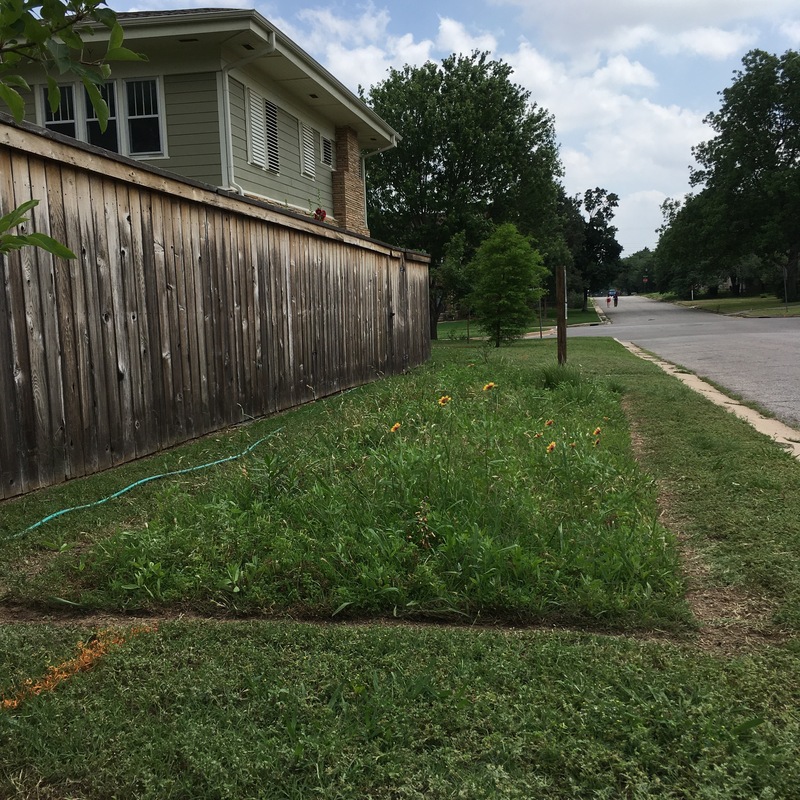 This is great news for the pocket prairie but not great for our neighbor who keeps a manicured lawn of only Bermuda grass. Our neighbor to the south is no longer facing the prospect of moving her roses, she’s relieved too. I went out to water today, only the 3rd time, I’m really wanting this to be a natural thing and not put a lot of resources into it but noticed one of my purchased plants looks like it’s almost completely dried out. Hopefully I got to it in time, if not we will have no Golden False Indigo. Until I buy another. Ha. 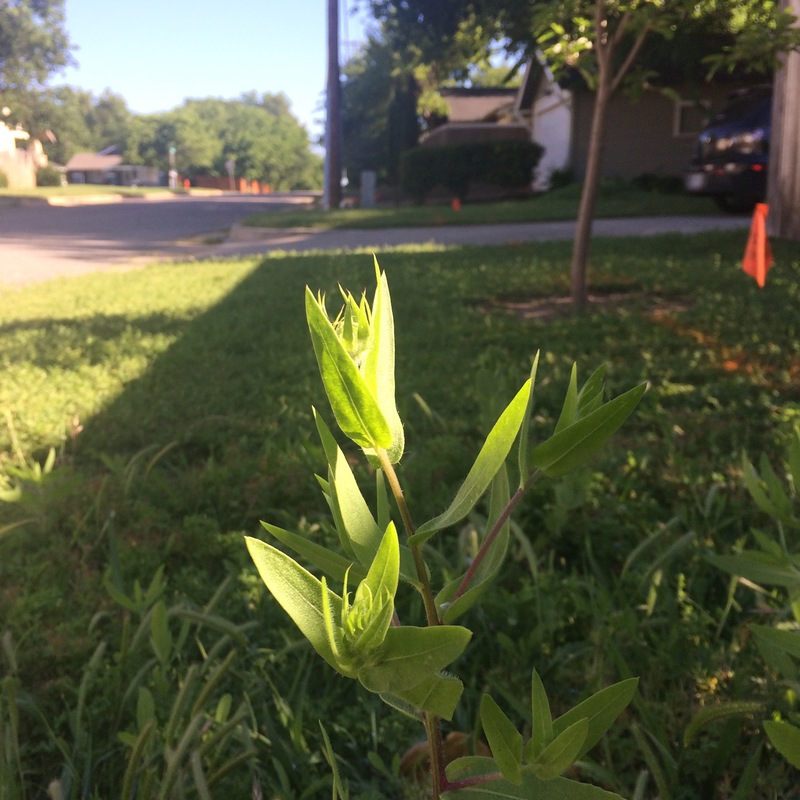 Anyhow, as I was watering I had the pleasure of talking very briefly to a lady walking by who was interested to know if I had any Milkweed growing out there so I told her about seeding some and planting another and how it had Milkweed Bug eggs and nibbles. We talked a little about the butterflies needing all the help they can get. Great interaction. I’m glad people are interested. I went out this morning to see if I could find anything interesting happening in the pocket prairie. I was hoping to see something new starting to bloom and we are getting really close to the first seeded flowers opening up but I noticed somethings been eating on my milkweed. And Pooping on it. Here’s a potentially new word for you: frass. It’s an informal way to say (caterpillar) poo. Some of the master gardeners have t-shirts that say “Frass Happens” on one side and “roll with it” on the other (and there’s a dung beetle to boot!). So the dark, blue/black looking spot you see on that leaf, that’s frass. Couple that with the leaves being eaten on and I know SOMEONE caterpillar-like has been here. And someone has laid eggs on the bottom of the same leaves. The eggs are the tiny yellow pill shaped things in the top picture. Possibly, everyone is related. I’m still working on this since IDing eggs is new to me. For all I know, those are ladybug eggs. I’m hoping to get the opinion of more experienced people on Facebook. The other thing I’m waiting to see is the eaters in action. This will help me learn a lot more. All in all, I’m feeling very successful in planting something and attracting wildlife. Hopefully I can see them before they are gone! What do you think is eating, pooping and laying eggs here? I’m curious about your thoughts on all of this. 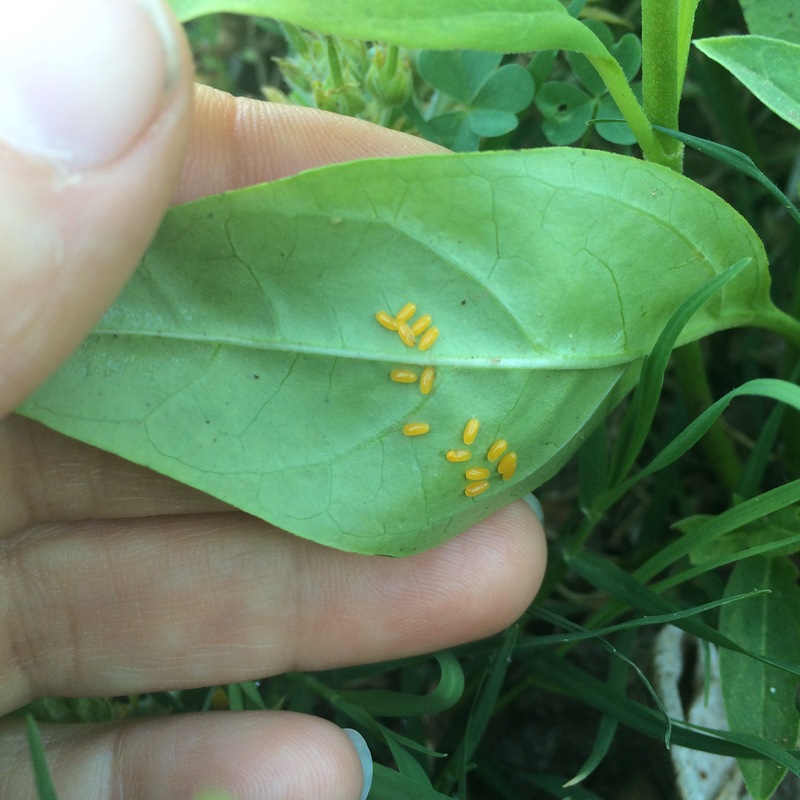 5/12/2016 The good people in a closed Facebook group about butterflies have helped me come to the conclusion that the eggs belong to a Milkweed Bug and not a butterfly. This is still a win in my mind because I see that a bug who likes milkweed has found mine. And it hasn’t been there all that long. I have gone out to inspect and look for the nibblers but have yet to see them. Next idea is to go after dark with a flashlight. 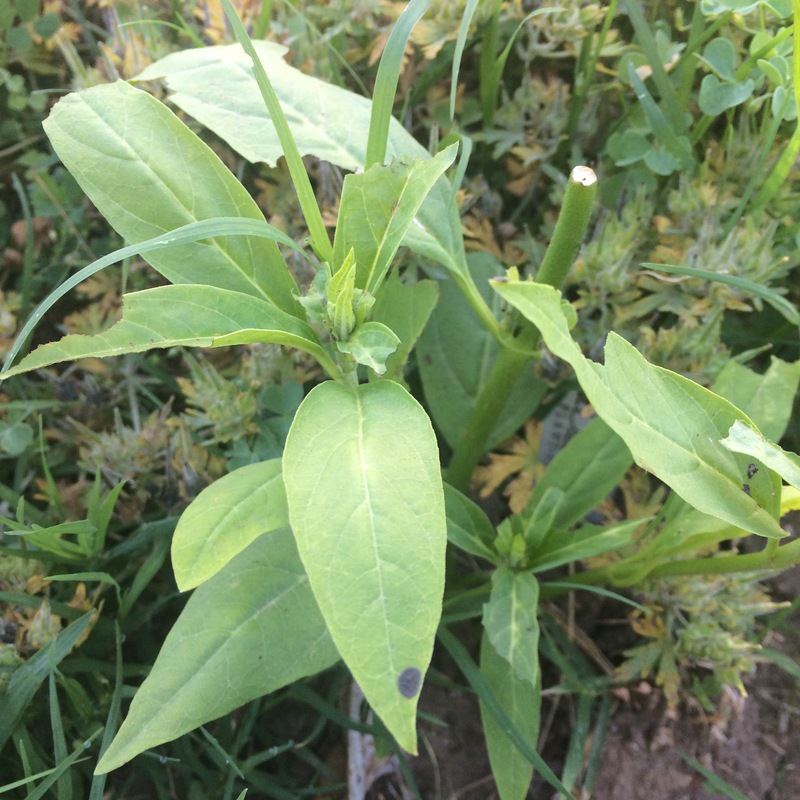 I also inspected the milkweed growing in my backyard. It has no damage and no eggs. Its all very interesting to me. But I also have 2 hens that are frequently out in the yard inspecting everything for me. lol. Turns out we are going to get a new primary electrical line in the easement along Military Ave. and they were out marking utilities, mostly the AT&T lines that run through our yard. I asked if they’d dig or bore and they seemed to think they might be able to bore under the pocket prairie but these are the guys that mark the lines, not the ones that will put in the line. He said because of the sign, they’d probably bore under knowing we’ve put work into it. It does still look like I’m just letting the weeds grow so hopefully the sign will save me some heartache. The lesson here? Probably something about putting a sign up when your intentions might not yet be clear. Or something along the lines of that and not expecting people to just know what the heck you are doing. This is our first year and it’s going to be interesting. HA. So you’re interested. You love the idea of bringing butterflies into your garden and have even heard they can help with pollination. Now what? What do they need? Can you just plant any kind of flowers and hope for the best? Maybe. Maybe not. Are there other things you can do to make your yard or garden a more inviting place? Let’s find out. Let’s start with butterfly food. Butterflies drink with their proboscis rather than eat. They love nectar but will go for other things too like tree sap or even sweat. believe it or not, they need minerals too. 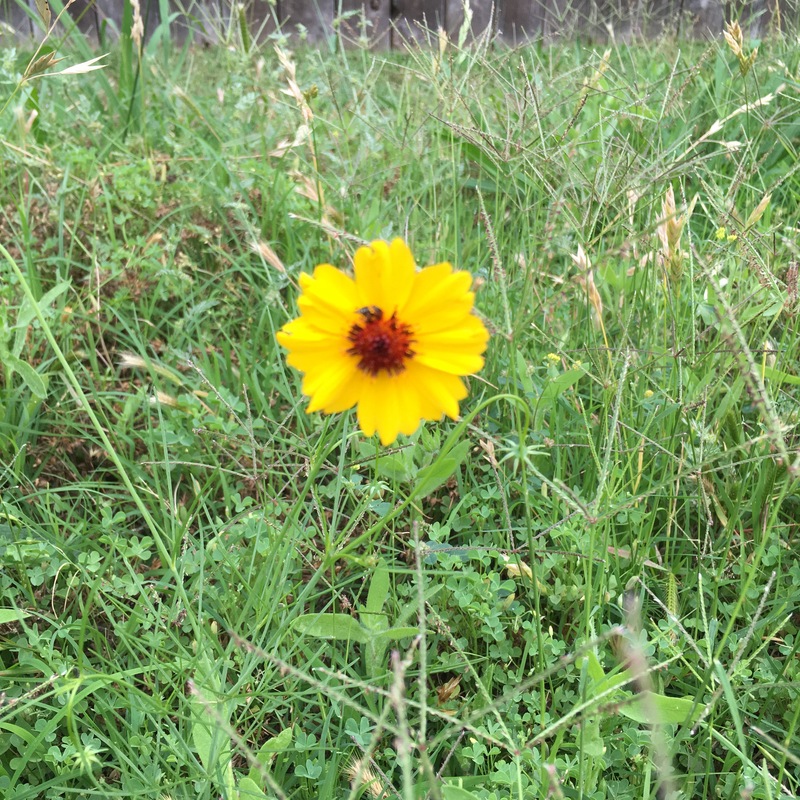 You can have cut fruit, shallow dishes of water or store bought nectar around your yard but more important is to have the right flowers in you yard. They are attracted to the flowers and flowers are way more appealing than dishes. See the list of Nectar Plants provided below. The following plants offer the best chance for attracting a wide variety of Oklahoma Butterflies. In addition to nectar plants you will want to have host plants for the caterpillars (larva). This is where the butterflies will lay their eggs. When the eggs hatch the larva will be hungry. Caterpillars eat the leaves from host plants and it’s important to have the kind of plants the caterpillar you want to attract will eat. You should choose host plants based on what butterflies are native to your area and what their caterpillars like. While the butterfly drinks nectar, the caterpillars eat only plants. Don’t be surprised if they eat every leaf off of the host plant. You may want to consider it a sacrifice to the butterflies. You may also want to plant several, not just one of each plant. It’s also a good idea to plant things that will bloom at different and overlapping parts of the year. Staggering bloom time will help extend your flower enjoyment but also keep the butterflies coming back to your yard. Be weary of insecticides. If it kills other 6-legged or 8-legged things, it will probably kill your butterflies too. Read labels and find the best time of day to use it if you must. What have I left out? I’m not a butterfly expert and I’m always learning. Send me a message or leave a comment if you see anything I should fix.